RalA and RalB GTPases regulate cell motility, morphology, signaling, vesicular trafficking, and endo/exocytosis. The regulation of these functions is critical for the development and spread of cancer1-4, implicating Ral in oncogenesis and metastasis. Both isoforms are integral for Ras-mediated tumorigenesis, metastasis, and invasion2-6. Despite sharing 82% amino acid sequence identity, effectors, and structural/biochemical properties4, RalA and RalB have their own unique functions in oncogenesis due to distinct subcellular localization and differential effector interactions2,4,7,8. 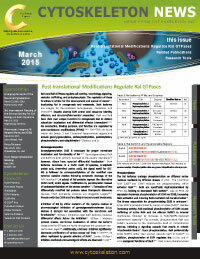 Ral localization, binding partners, and function are regulated by post-translational modifications (PTMs)2,4,9-11. Ral PTMs are found within the Switch 1 and C-terminal hypervariable regions and include geranylgeranylation, carboxymethylation, palmitoylation, phosphorylation, and ubiquitination3,4 (Tables 1 and 2). Geranylgeranylation (GG) is necessary for proper membrane localization and functionality of Ral12,13. Geranylgeranylated RalA and RalB are both similarly localized to the plasma membrane13; however, others have reported differential localization11. Both isoforms terminate in a CAAX motif (C=cysteine, A=aliphatic amino acid, X=terminal amino acid), the signal motif for GG4. GG is followed by carboxymethylation of the modified now terminal cysteine residue following enzymatic cleavage of the AAX residues4,14. A subset of Ral proteins express the alternative CCAX motif, which signals modification by palmitoylation instead of carboxymethylation on the second cysteine4,15. Formation of two differentially modified Ral proteins raises therapeutic dilemmas because CAAX processing enzymes are druggable targets16,17. Proteins with the CCAX motif are likely immune to such treatments. Inhibition of GG by either mutation of the cysteine residue or pharmacological inhibition of geranylgeranyltransferase (a.k.a. GGTase I) disrupts Ral association with the membrane and functionality13. GGTase I inhibitors target both isoforms; however, differential effects follow the inhibition13. GGTase I inhibitors prevent plasma membrane localization of either Ral isoform; instead the Ral GTPases are found throughout the cytoplasm and perinuclear region13. Additionally, a GGTase I inhibitor significantly decreases proliferation of various cancer cell lines in vitro18,19, an effect replicated by genetic ablation of RalA18. Similar GGTase I inhibitor-mediated anti-tumorigenic effects are observed in vivo19. Legend: Bold residues are Switch 1. Others are Hypevariable Region. Red indicates sequence overlap. Phosphorylation sites are green. Ubiquitination site is purple. The Ral isoforms undergo phosphorylation on different serine residues mediated by different kinases in vitro. The C-terminal RalA S18320 and S19421 residues are phosphorylated, which activates RalA10,21. Both are specifically dephosphorylated by PP2A Ab, leading to decreased RalA activity20. Loss of PP2A Aβ expression increases phosphorylation of S194 and S183, increasing RalA activation and inducing RalA-mediated cell transformation20. The kinase responsible for phosphorylating S183 is unknown22, while S194 is phosphorylated by Aurora A kinase (AAK)21. Besides increasing activity, AAK-mediated phosphorylation of S194 causes trafficking of active RalA and the effector RalBP1 to internal membranes, followed by increases in RalA/RalBP1-mediated downstream signaling10. For example, phosphorylated RalA and RalBP1 re-localize to the mitochondria itself or mitochondrial vesicles, initiating a signaling cascade that results in mitotic mitochondria fission23. Upon phosphorylation, RalA preferentially binds RalBP1 rather than exocyst subunits Sec5 or Exo8410. In addition, phosphorylation of S194 regulates the in vivo and in vitro oncogenic functions of RalA10,21. RalA is also phosphorylated by PKA22 on yet to be described residues. AKA inhibitors significantly decrease proliferation of cancer cells in vitro18,19, reduce in vivo tumorigenesis19, and prevent RalA activation in cancer cells19. RalB is phosphorylated by PKC on S19824 and PKC alpha on S1929. Phosphorylation of S198 stimulates activation of RalB9, causes relocalization from plasma membrane to the perinuclear region24, including endocytic vesicles9, and regulates RalB oncogenic functions such as anchorage-independent growth, cell motility, and actin cytoskeleton dynamics in vitro24. In vivo, RalB S198 phosphorylation is necessary for tumor growth and metastasis24. Additionally, S198 phosphorylation alters RalB’s effector interactions. Phospho-mimetic RalB is bound to RalBP1 preferentially at the endomembranes while phospho-deficient RalB is bound to Sec5 at the plasma membrane. The phosphorylation state of RalB regulates vesicle trafficking to and fusion with the plasma membrane and the subsequent release of vesicle cargo proteins9. Ubiquitination identifies proteins destined for proteasome-mediated degradation as well as regulating a protein’s activity, localization, or binding partner(s). The Ral isoforms are mainly monoubiquitinated in a nondegradative manner independent of activation state25. However, RalA, but not RalB, is modified by nondegradative ubiquitination under anchorage-independent conditions. While both Ral isoforms can be found at the plasma membrane and endomembranes, constitutively ubiquitinated Ral constructs induce robust plasma membrane enrichment of RalA, but not RalB, which is localized as distinct puncta intracellularly. RalA ubiquitination triggers lipid raft enrichment at the plasma membrane. RalA is deubiquitinated in the raft microdomains which is necessary for endocytosis of the rafts25. In a cyclical manner, endocytosis of lipid rafts caused an increase in RalA ubiquitination while blockade of endocytosis triggered a decrease. Several lysine residues are viable sites for Ral ubiquitination25. Ubiquitination of the Lys47 RalB residue determines effector binding and subsequent functionality. When ubiquitinated, RalB binds to Sec5 rather than Exo84; however, upon deubiquitination, RalB binds to Exo84 preferentially26. Binding to the former effector mediates innate immune response signaling while binding to the latter mediates autophagocytosis26. Ral GTPases undergo a multitude of PTMs that regulate their activity, subcellular localization, effector binding, and ultimately, function. Given the involvement of Ral proteins in Ras-mediated oncogenesis, there is a clear impetus to develop therapeutics that target Ral activation27. Besides directly targeting Ral binding to downstream effectors27, another therapeutic avenue is modulation of Ral activity by increasing or decreasing certain PTMs. 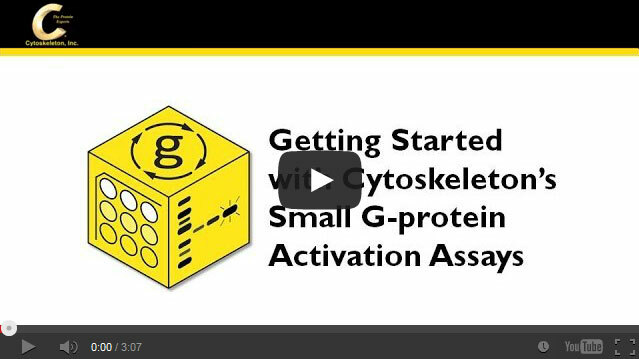 To study this untapped therapeutic potential, Cytoskeleton offers Ral activation assays and monoclonal antibodies that specifically target such PTMs as acetylation, phosphorylation, and ubiquitination. Camonis J.H. & White M.A. 2005. Ral GTPases: corrupting the exocyst in cancer cells. Trends Cell Biol. 15, 327-332. N.F. Neel et al. 2011. The RalGEF-Ral effector signaling network: The road less traveled for Anti-Ras drug discovery. Genes Cancer. 2, 275-287. D.F. Kashatus. 2013. Ral GTPases in tumorigenesis: Emerging from the shadows. Exp. Cell Res. 319, 2337-2342. L.R. Gentry et al. 2014. Ral small GTPase signaling and oncogenesis: More than just 15 minutes of fame. Biochim. Biophys. Acta. 1843, 2976-2988. Bodemann B.O. & White M.A. 2008. Ral GTPases and cancer: linchpin support of the tumorigenic platform. Nat. Rev. Cancer. 8, 133-140. K.-H. Lim et al. 2005. Activation of RalA is critical for Ras-induced tumorigenesis of human cells. Cancer Cell. 7, 533–545. Y. Chien & M.A. White. 2003. RAL GTPases are linchpin modulators of human tumour-cell proliferation and survival. EMBO Rep. 4, 800-806. K.-H. Lim et al. 2006. Divergent roles for RalA and RalB in malignant growth of human pancreatic carcinoma cells. Curr. Biol. 16, 2385-2394. T.M. Martin et al. 2012. Phosphorylation by protein kinase Ca regulates RalB small GTPase protein activation, subcellular localization, and effector utilization. J. Biol. Chem. 287, 14827-14836. K.-H. Lim et al. 2010. Aurora-A phosphorylates, activates, and relocalizes the small GTPase RalA. Mol. Cell. Biol. 30, 508-523. M. Shipitsin & L.A. Feig. 2004. RalA but not RalB enhances polarized delivery of membrane proteins to the basolateral surface of epithelial cells. Mol. Cell. Biol. 24, 5746-5756. B.T. Kinsella et al. 1991. Carboxyl-terminal isoprenylation of Ras-related GTP-binding proteins encoded by racl, rac2, and ralA. J. Biol. Chem. 266, 9786-9794. S.C. Falsetti et al. 2007. Geranylgeranyltransferase I inhibitors target RalB to inhibit anchorage-dependent growth and induce apoptosis and RalA to inhibit anchorage-independent growth. Mol. Cell. Biol. 27, 8003-8014. K.F. Leung et al. 2007. Rab GTPases containing a CAAX motif are processed post-geranylgeranylation by proteolysis and methylation. J. Biol. Chem. 282, 1487-1497. A. Nishimura & M.E. Linder. 2013. Identification of a novel prenyl and palmitoyl modification at the CaaX motif of Cdc42 that regulates RhoGDI binding. Mol. Cell. Biol. 33, 1417-1429. A.M. Winter-Vann & P.J. Casey. 2005. Post-prenylation-processing enzymes as new targets in oncogenesis. Nat. Rev. Cancer. 5, 405-412. S.A. Holstein & R.J. Hohl. 2012. Is there a future for prenyltransferase inhibitors in cancer therapy? Curr. Opin. Pharmacol. 12, 704-709. M. Ezzeldin et al. 2014. RalA signaling pathway as a therapeutic target in hepatocellular carcinoma (HCC). Mol. Oncol. 8, 1043-1053. K. Wang et al. 2013. The role of RalA in biology and therapy of ovarian cancer. Oncotarget. PMID: 24632623. A.A. Sablina et al. 2007. The tumor suppressor PP2A Ab regulates the RalA GTPase. Cell. 129, 969-982. J.-C. Wu et al. 2005. Identification of V23RalA-Ser194 as a critical mediator for Aurora-A-induced cellular motility and transformation by small pool expression screening. J. Biol. Chem. 280, 9013-9022. A.A. Sablina & W.C. Hahn. 2007. The role of PP2A A subunits in tumor suppression. Cell Adh. Migr. 1, 140-141. D.F. Kashatus et al. 2011. RalA and RalBP1 regulate mitochondrial fission at mitosis. Nat. Cell Biol. 13, 1108-1115. H. Wang et al. 2010. Phosphorylation of RalB is important for bladder cancer cell growth and metastasis. Cancer Res. 70, 8760-8769. V. Neyraud et al. 2012. RalA and RalB proteins are ubiquitinated GTPases, and ubiquitinated RalA increases lipid raft exposure at the plasma membrane. J. Biol. Chem. 287, 29397-29405. M. Simicek et al. 2013. The deubiquitylase USP33 discriminates between RalB functions in autophagy and innate immune response. Nat. Cell Biol. 15, 1220-1230. C. Yan et al. 2014. Discovery and characterization of small molecules that target the GTPase Ral. Nature. 515, 443–447.